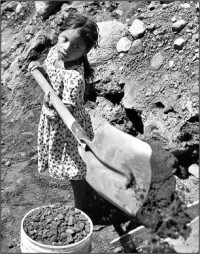 THE global financial crisis could push an increasing number of children, particularly girls, into child labour, according to a new report issued by the International Labour Office (ILO) for the World Day Against Child Labour on June 12. The ILO report, entitled Give Girls a Chance: Tackling child labour, a key to the future , notes that while recent global estimates indicate the number of children involved in child labour has been falling, the financial crisis threatens to erode this progress. “We have seen some real progress in reducing child labour. The policies chosen in the present crisis will be a test of national and global commitment to take this fight forward.” said ILO Director-General Juan Somavia. The report says the danger of girls being forced into child labour is linked to evidence that in many countries families give preference to boys when making decisions on education of children. It states that because of the increase in poverty as result of the crisis poor families with a number of children may have to make choices as to which children stay in school. In cultures in which a higher value is placed on education of male children, girls risk being taken out of school, and are then likely to enter the workforce at an early age. Other factors which could push up the numbers in child labour include cuts in national education budgets, and a decline in remittances of migrant workers, as these remittances often help to keep children in school. This year's World Day against Child Labour also coincides with the tenth anniversary of ILO Convention No. 182 on the elimination of the worst forms of child labour. *In many societies girls are in an inferior and vulnerable position and are more likely to lack basic education. This seriously restricts their future opportunities. The report highlights the importance of investing in the education of girls as an effective way of tackling poverty. Educated girls are more likely to earn more as adults, marry later in life, have fewer and healthier children and have decision-making power within the household. Educated mothers are also more likely to ensure that their own children are educated, thereby helping to avoid future child labour.